2014 and 2015 were good years for orcs. And not just because World of Warcraft is still going strong - Shadow of Mordor reintroduced them to the video gaming world as the intimidating threat they were intended to be (with a curiously meritocratic society, to boot), and the Tarkir block reintroduced them to Magic as much the same thing. For aggressive decks, we tend to look mainly at the one and two cost creatures to start with, and occasionally forget that your top end defines your chances almost as much. Brutal Hordechief is an endgame all by himself - even just one or two teammates can make a difficult and vexing life swing each attack step. And his activated ability, despite looking more limited than Master Warcraft, is actually just as devastating: you can make all the opponent's creatures block your smallest creature while your Gurmag Angler swims through unhindered. 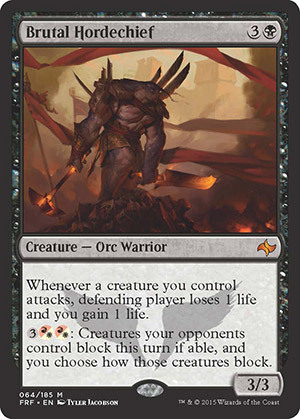 The number eight card of the year is Brutal Hordechief which is a four mana Black 3/3 that has the defending player lose one life and you gain one life whenever a creature you control attacks and for three and two White or Red mana any opposing creature able to block must do so and you choose how they block. This is a very impressive and dangerous card that can immediately halve the clock when it hits play or outright win the game depending on the number of creatures in play. The life gain is a nice bonus and the potential to choose blocking when running Red or White is an amazing combination with Deathtouch, particularly if supported with First Strike or other effects. Overall this is a very strong card that will see play in current formats and across different decks that use Black, particularly Black/White tokens or very aggressive Rakdos builds. In Limited this is an easy first pick in Booster that may not have the swarm support of a Constructed build, but should still impact the game with a noticeable swing in life points. It is even stronger if the effect can be used with White or Red to manage an alpha strike and even as a four mana 3/3 it wouldn't be unplayable. The life drain aspect with just one Black mana in the base cost gives it a strong position in Sealed as well and it should be played whenever possible. It's nice. Evasion/control of combat's a nice ability to have, the hybrid cost of the ability is nice for people who're running mardu colors, not so much for R/B or B/W. It's a lot higher on the list than I'd have it, but whatever. Cool card, bro.